We fancied another go at backpacking this year. 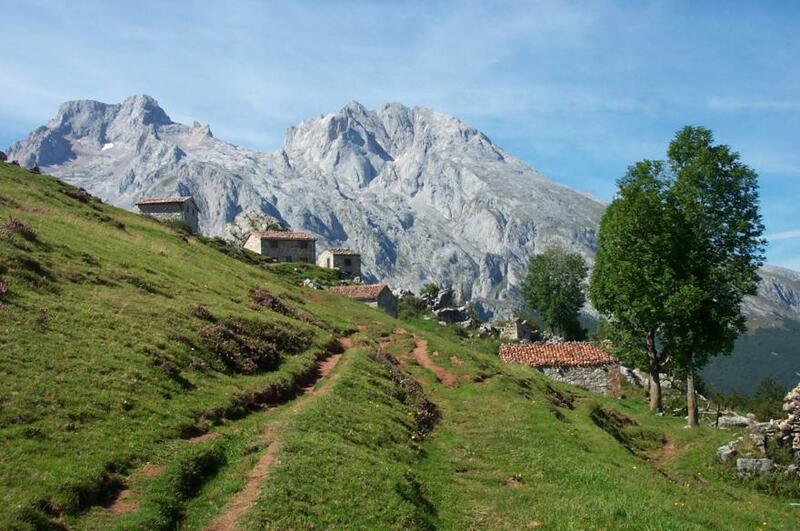 Previously, we had considered the Picos de Europa in northern Spain for cycling but it seemed like it might be a good place to go trekking too. Some friends of ours often go there on their motor bikes and the photos looked good so we started looking for possible routes. 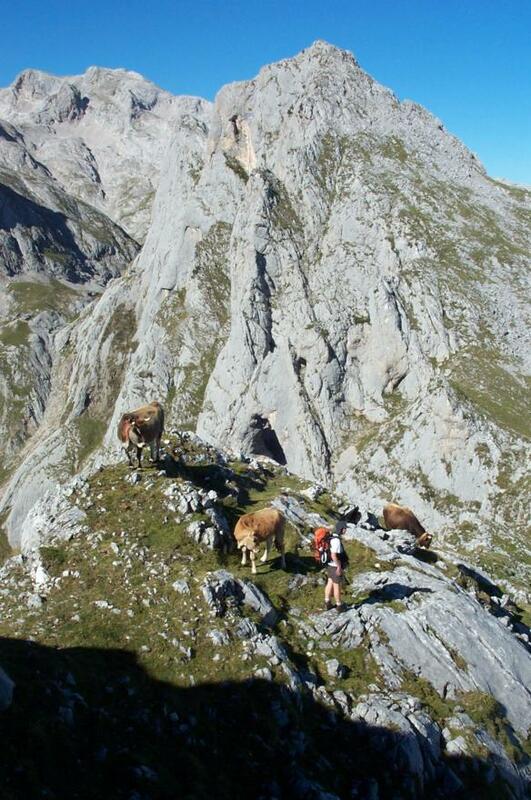 In the Lonely Planet guide to Walking in Spain there is a 9-day circular route of the Picos so we plumped for that. 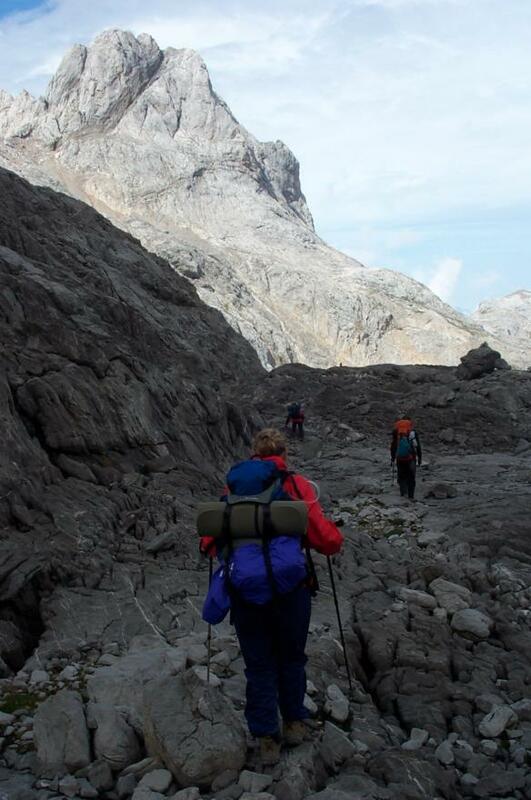 Anne has also written up this story for our mountaineering club magazine. You can find here words here. 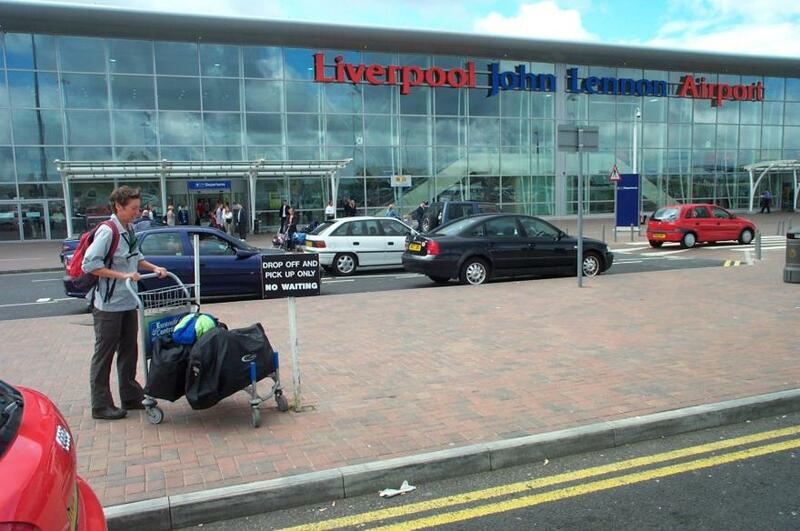 Saturday, 7th September and we left Liverpool John Lennon Airport on the EasyJet flight to Madrid. I had booked a hire car (not with EasyCar) over the internet and were a little concerned when we got there to find no desk and nobody to meet us. However, after about half an hour someone turned up and we quickly had our diesel Corsa and we were away. 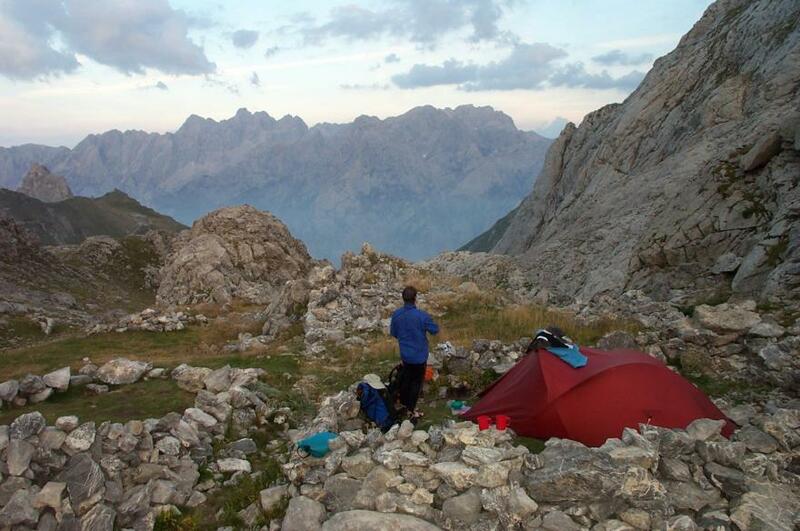 It took about four hours to get as far as Burgos where, after a little difficulty, we found a very nice camp site. In the morning we wandered into the town to find some breakfast - nice place. 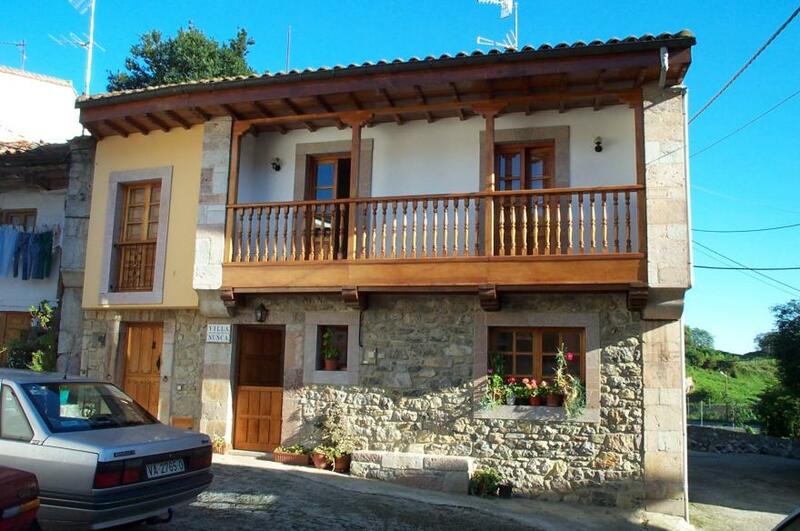 Through morris dancing, we know someone with a holiday home in the village of Cue near Llanes on the northern coast. They kindly offered to put us up so this was our destination for the second night. 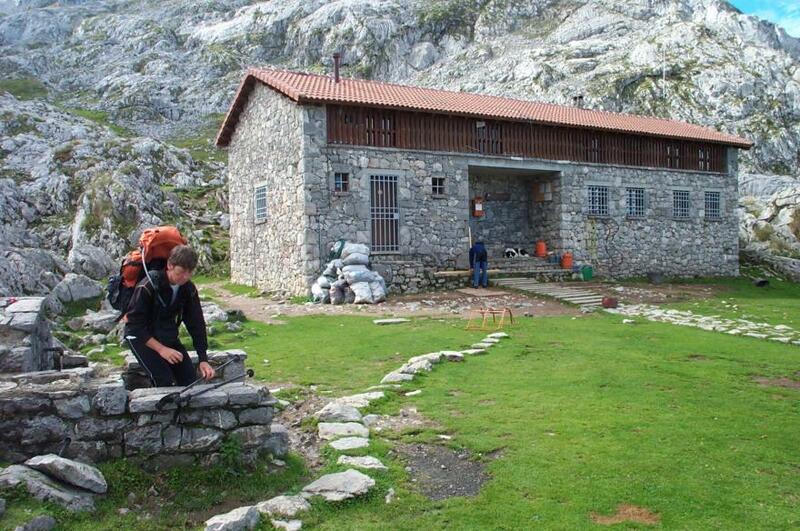 We had planned to spend the next night in the Refugio at Vega de Enol. 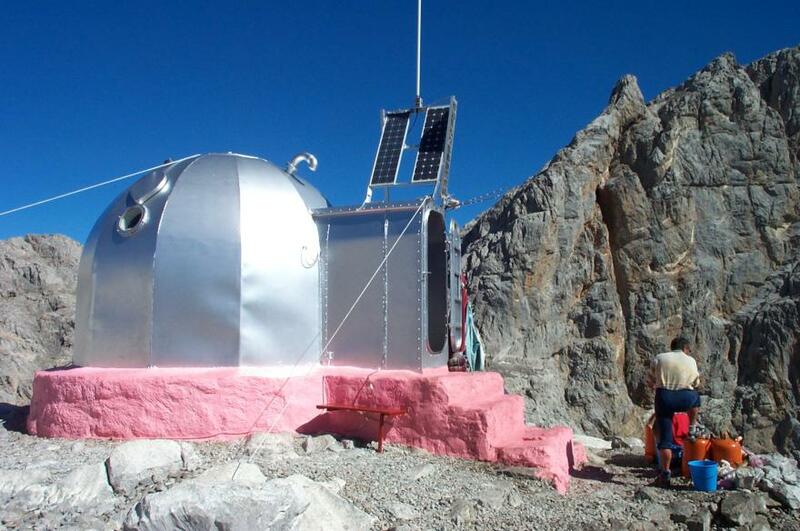 But when we arrived we discovered that it was closed and, since we were below 1600m, no camping was allowed. The very helpful park ranger suggested that we press on to the next Refugio. By now it was after 3pm so we quickly packed our stuff together and set off. 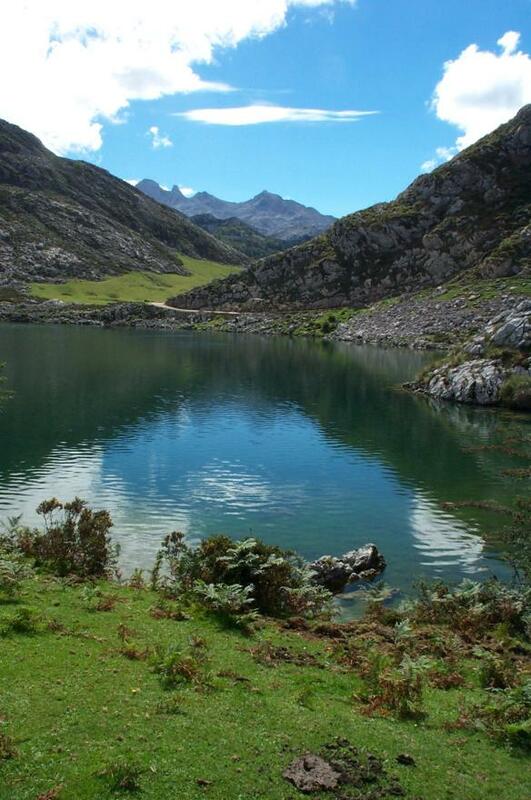 After 15 minutes we reached the second lake, Lago de la Ercina. The route was quite easy - if muddy in parts - and the 'natives' were friendly. 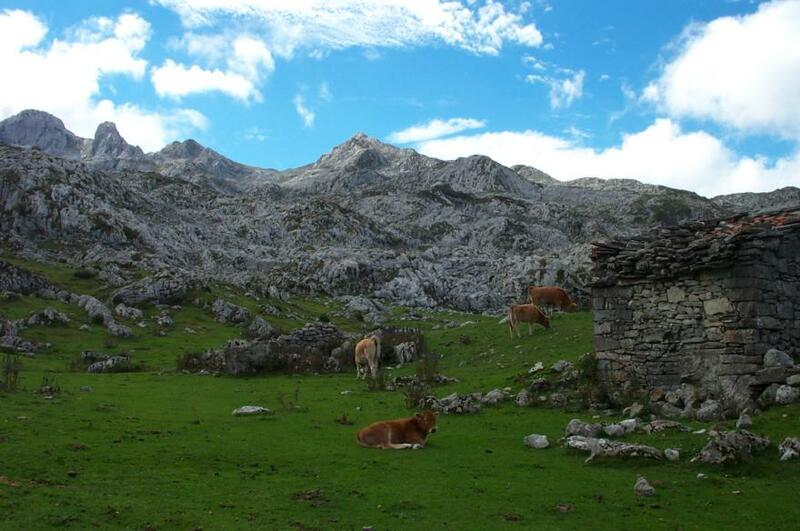 This is the meadow near Las Bobias. It wasn't until nearly 7:30 that we reached the Refugio Marques de Villaviciosa and just too late to order a meal from the grumpy guardian. Two other Brits, Sian and Phil, were already there and, with some effort, had managed to get a meal out of him. 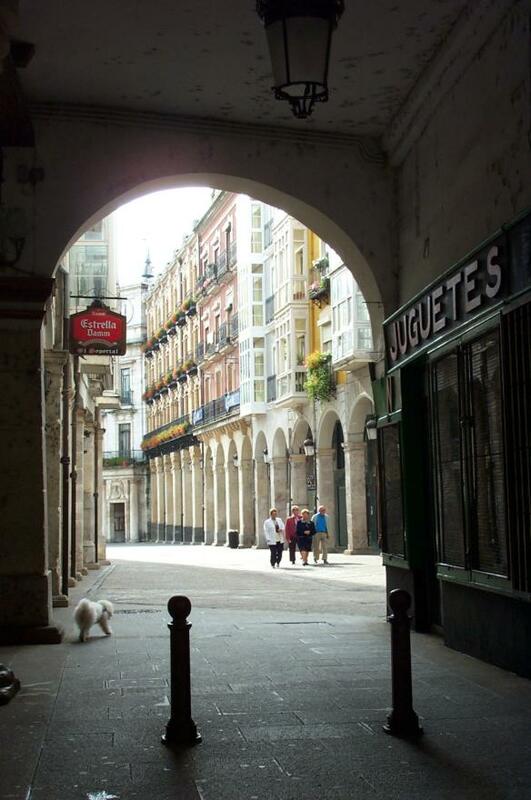 A Spanish group arrived at the same time as us and the guardian quickly upset them too. Phil speaks a little Spanish - enough to understand that the air turned quite blue! It turned out that Sian and Phil planned to walk the same route as us. This is the view from the top of Jultayu (1940m), next morning. Anne's looking down into the Cares Gorge, a long way below! 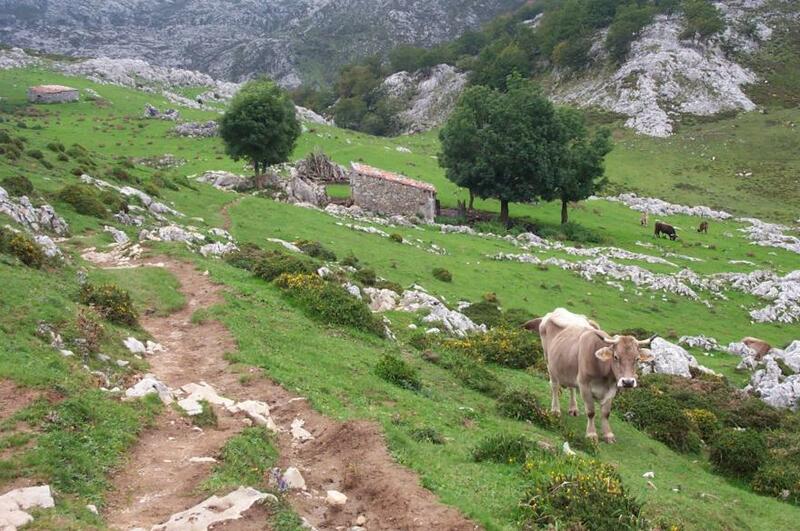 In the other direction you can make out the sea, and in the middle of a meadow a small dot - the Refugio Villaviciosa. A family group of cows (and Anne!) hovering near the edge of a nasty drop. They were reluctant to move away. Later that day we found that a cow had recently fallen to its death from Jultayu, so we reckon this lot were waiting for the missing family member to return. 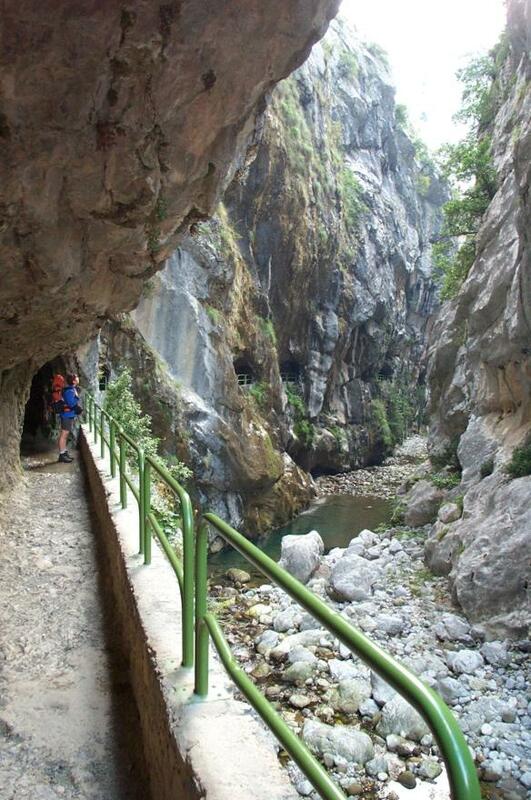 Descending the Canal de Trea. The descent took the best part of three hours, and was rather harder than this makes it look. 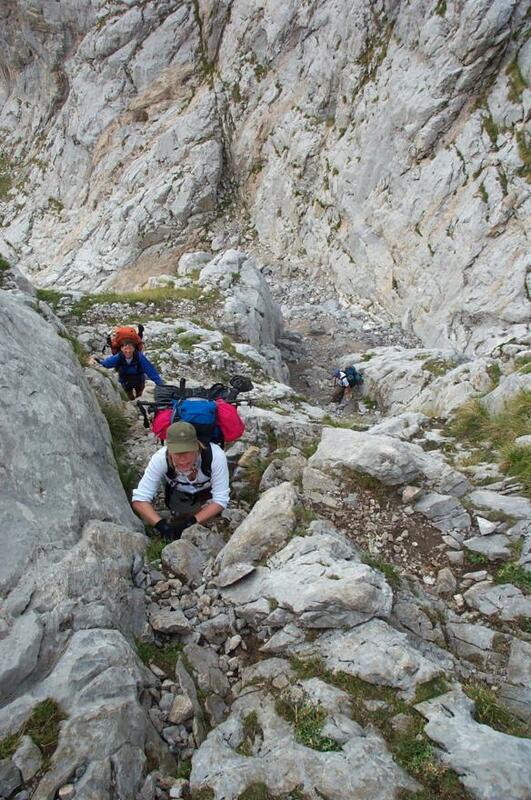 It was steep all the way - about 1500m descent from Jultayu top to the gorge, much of it on scree of various sizes. Because we'd been up to Jultayu in the morning, the sun was shining into the Canal by the time we made our way down. 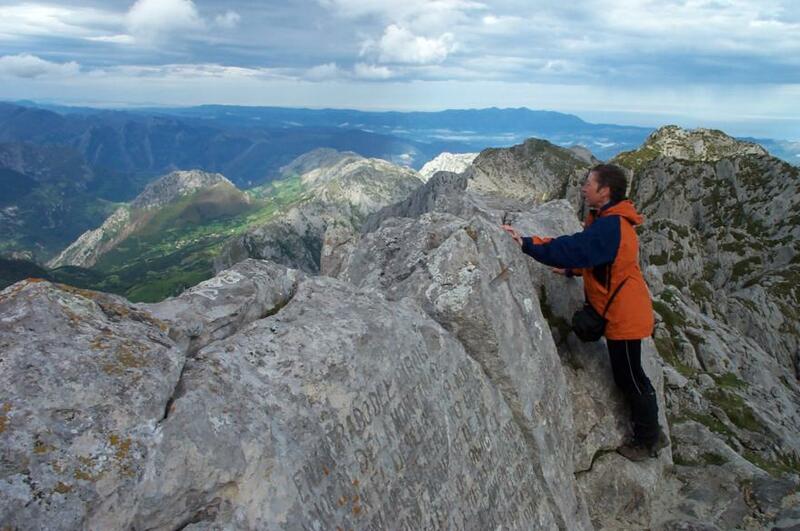 Apparently some people choose to ascend this route, but usually only do it once in a lifetime. 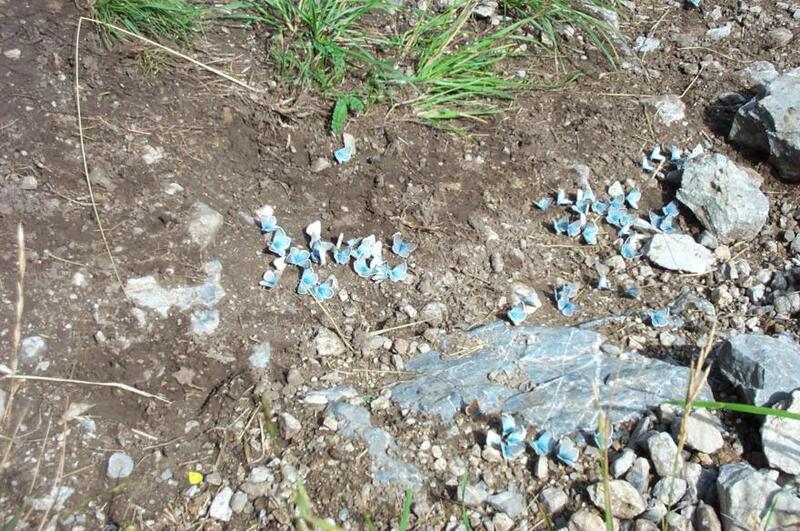 A settled cloud of silvery-blue butterflies, in the Canal de Trea. At last - the Cares Gorge! The last few minutes descent of the Canal were agonising - so near but still not on flat land! It was strange to see people strolling along the pathway cut above the river, ambling along completely unaware of the route we'd taken to get to the same place! Once at their level, walking was blissfully easy on the knees, and we headed south along the gorge to the village of Cain which we'd looked down on from Jultayu. View from Cain back up to the tops. It was difficult to work out exactly which was Jultayu; the rock is so steep that the perspective is confusing. The village lies at the north end of the access road for vehicles - if you want to go any further down the gorge you have to do so on foot. Spent the night in a small hotel, just to have a thorough soak in a hot bath and get rid of the day's dirt. Here the canal is cut well into the rock wall, the path passing above it. After lunch at Poncebos Jim had a swim in the extremely cold Rio Cares. Anne managed to wet her feet but it was too cold for anything else. 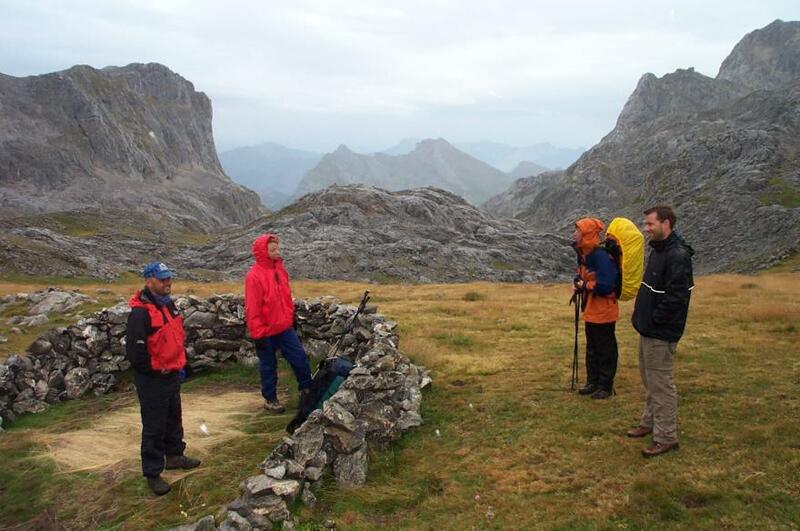 Refreshed, we then ascended around 400m to the village of Bulnes where we pitched our tent at the small camp site. This is the upper part of the village known as El Castillo. There are many dilapidated houses here and a few tastefully renovated ones. Over the three days we had bumped into the Spanish group quite a few times and started to get to know them. It turns out that Petra (blond in military fatigues) is actually English and, several years ago, married Luis (LHS) and moved to Spain. They are a great crowd and obviously love the mountain environment. 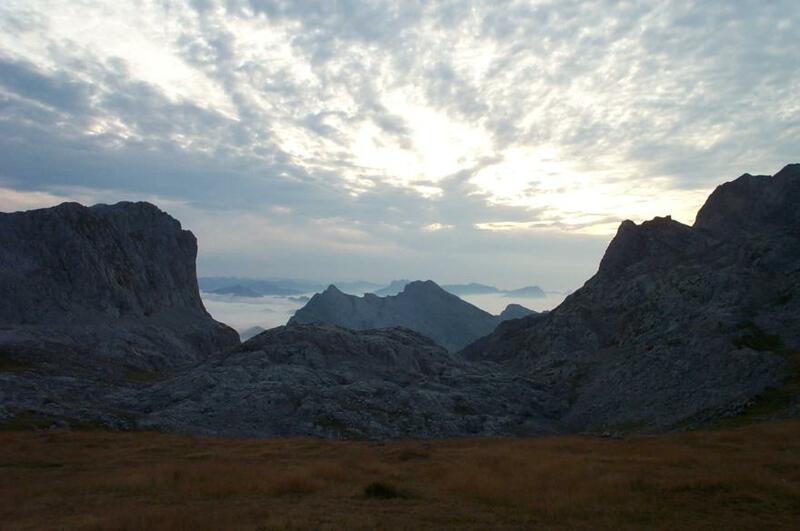 Our routes parted at Bulnes, so this is the farewell photo in the morning. 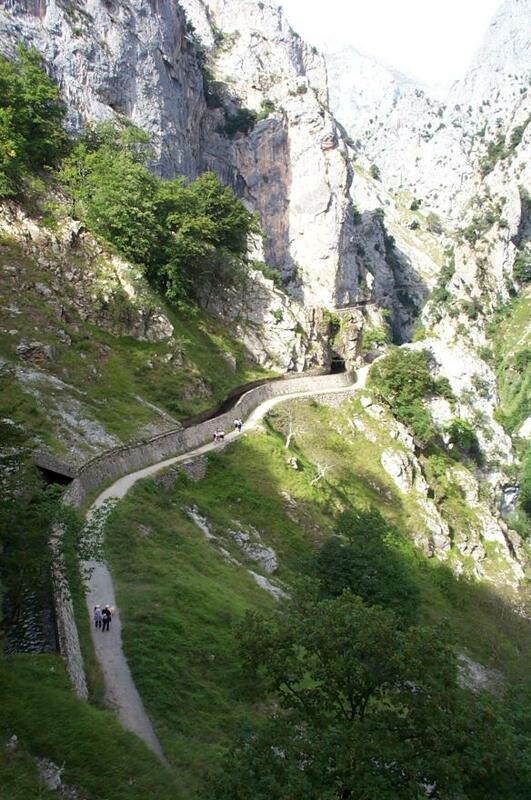 There is a direct route from Bulnes up to the Naranjo but I'm glad we didn't take it. Instead, we walked the other two sides of a triangle. This is the view of Terenosa, near the apex. Much of the surrounding area is meadow and very picturesque. 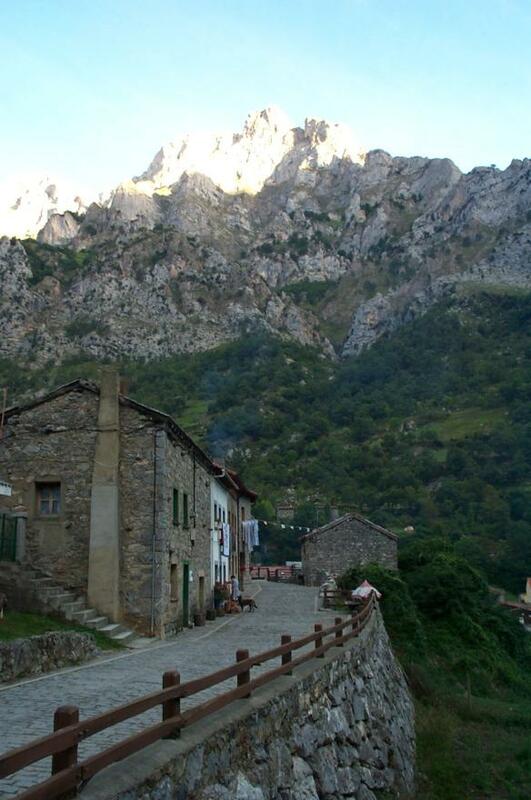 The direct route lies in the valley between the houses and the mountain. Apparently, it is quite steep and much of it is on scree. 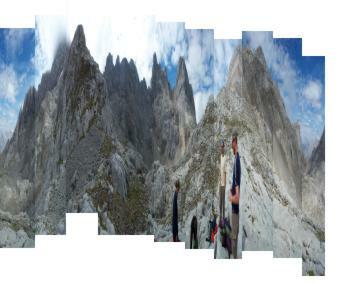 This is Pico Urriello (2519m) which is more usually known as the Naranjo de Bulnes. 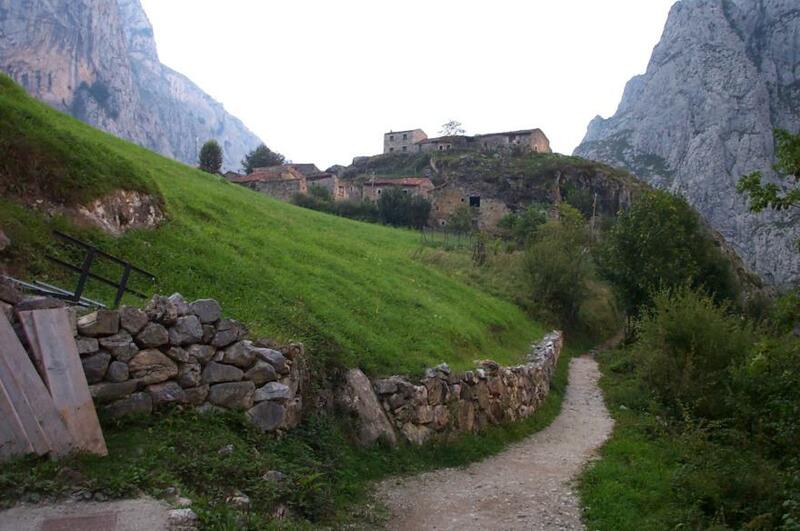 Translated directly it means the 'orange' of Bulnes and it gets its name from its colour in the setting sun. Beneath it is the Refugio de Urriellu (1953m) where we stayed. Brits far outnumbered every other contingent and we even found ourselves talking to a couple, Hilary and Peter Moffat, that we already knew through a mutual friend. Although we hadn't walked with Sian and Phil, we kept meeting up where we stopped for the night. However, the guide book had warned us that the next day was both long and hard so, for safety, we decided to stick together. We started out across something like a lunar landscape - huge bowls with debris-lined swallow holes. Then the book told of a steep scramble with a wire to hold on to. But we never saw the wire. This is us about to emerge on the ridge a few hundred metres to the right of where we should have been! 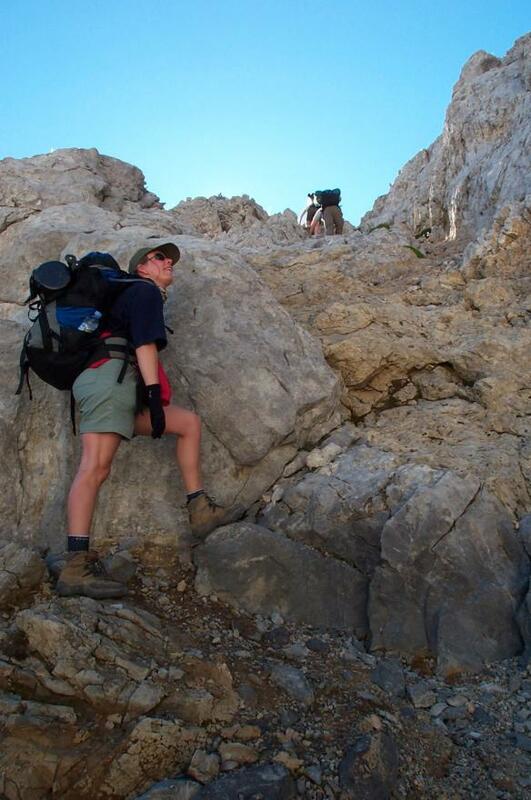 Scrambling was a new experience for Sian but, after an early 'girly moment', she thoroughly enjoyed it. Just on the other side of the ridge is the Cabana Veronica (2325m) which must be the strangest thing I've ever seen in the mountains. It used to be a gun turret on some American warship but now it has seven beds and a very fit warden. He has to carry in all the food and other essentials himself. There is even a table and some benches so we stopped for lunch. 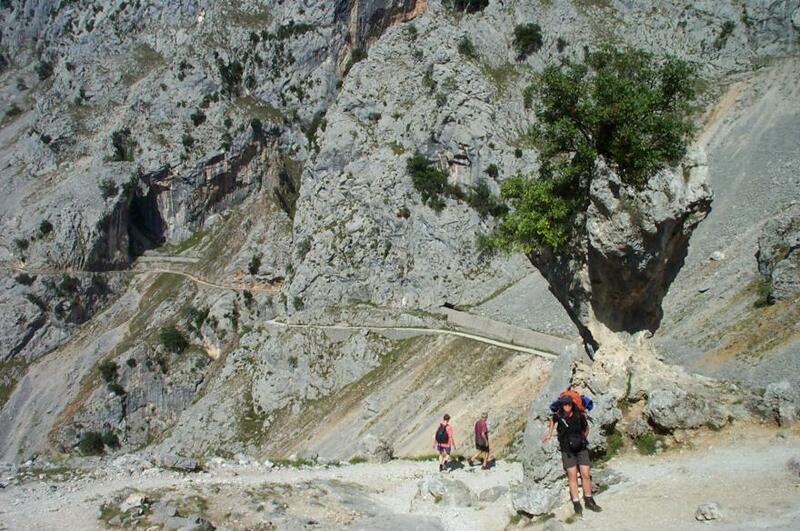 Now the going got really tough - just bare limestone and quite steep in parts. You can just see the silver dot of Veronica near the skyline. We started out on a route marked with yellow flashes but soon parted company. In the end we just made our own way down the hill to the path that we wanted. Fortunately, it ran along the top of a cliff and not the bottom as it is marked on the map. We were beginning to realise quite how inaccurate the Spanish maps are. Finally, our destination is in sight. 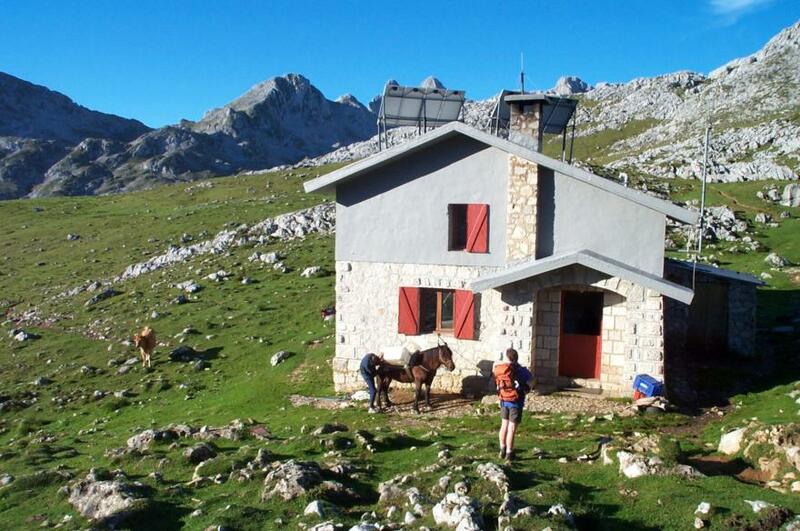 The Refugio de Jermoso (2046m) is perched on safe(!) ground beneath the Torre de Penalba. However, our path to it crossed some distinctly dodgey scree. Anne was showered in stones as a group of goats moved about above her. 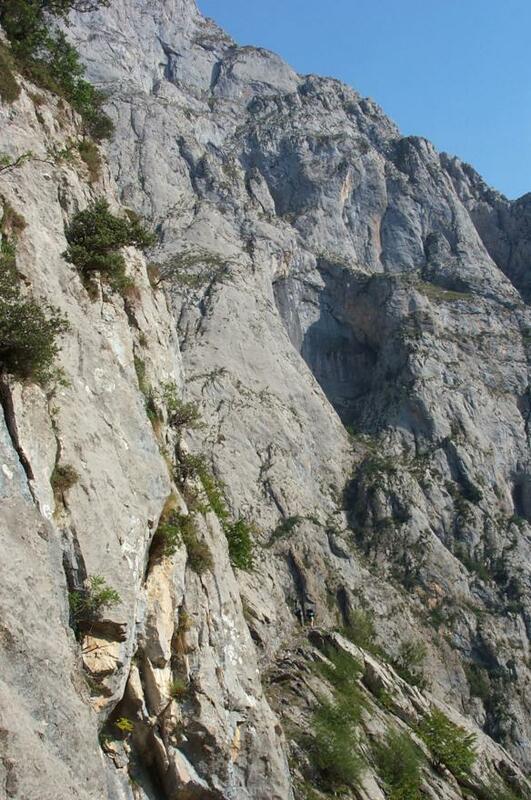 The next morning we had to descend the gorge in front of the Refugio. 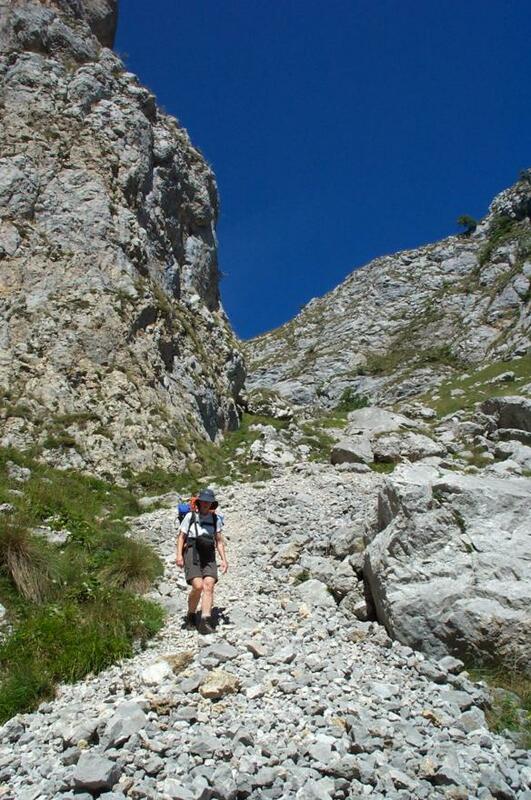 The route was easy to follow but VERY steep. At on point Sian got one boot so firmly wedged that she had to take her foot out, climb down and then tug it free. Nearly down and we could see the road but the path turned out to have one more surprise for us. The last section wraps itself round a cliff and, in places, is hewn out to make it safe for animals on their way to the grazing pasture. With four legs it may feel safe but with two and a heavy pack some of it felt distinctly exposed. Down at last. 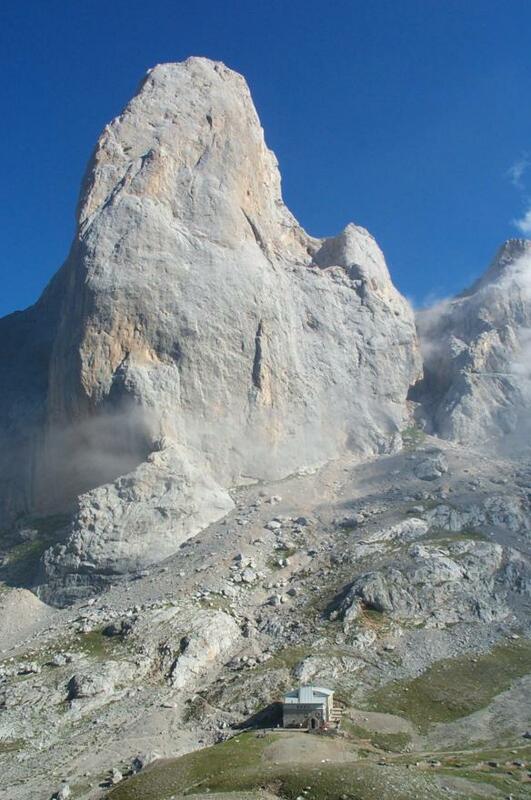 This is Cordinanes (860m) with the Torre de Penalba on the skyline, top-right. We stayed in a small hotel in the village, together with the Moffats who had reversed our route. There is no shop so we walked to Posada de Valdeon for provisions. Another day, another climb. And this turned out to be a tiring one. We knew that water would be a problem so we set out fully loaded. 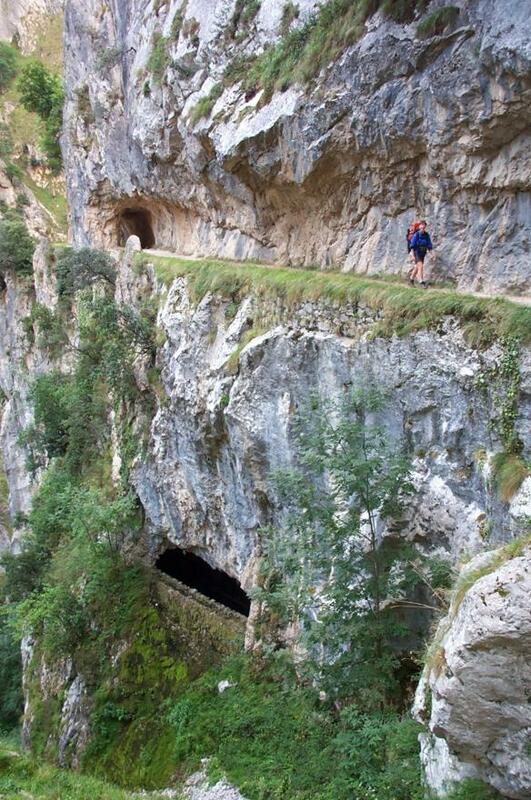 The route back onto the Western Massif snakes its way around the cliff-face and up the Canal de Capozo. Here's Sian and Phil on the track a little way ahead. We kept our eyes and ears peeled for running water but, this being limestone country, there wasn't any. There are two springs marked on the map but, in reality, they were barely a trickle. We all started to get tired and worried. The book describes a fountain near the top and sure enough it was there. Nothing was flowing out of the spout but there was a big trough that was still full of water - and wriggly things! Phil and I spent over an hour pumping away on my filter to give us enough water for that night plus the next day. 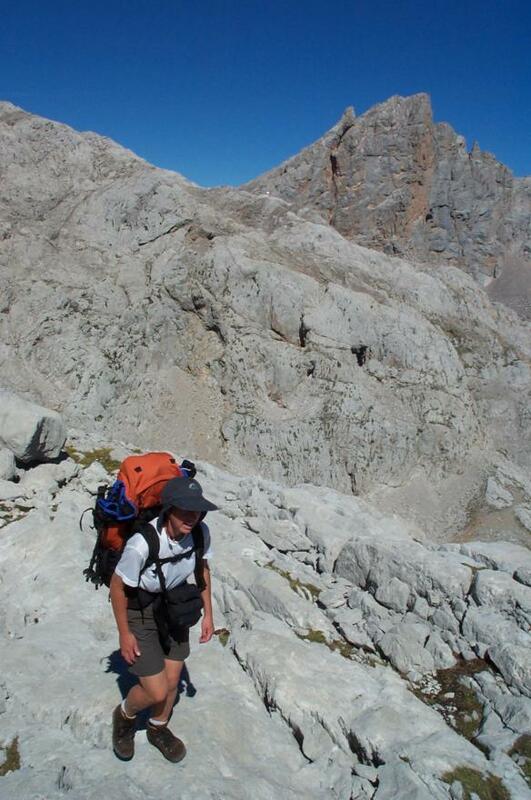 We finally staggered onto the col at Vega Huerta (2040m) late in the evening. There is no Refugio so we had to camp, but what a beautiful place. This is looking back east from where we had come. And this is looking west into the sunset and onto the clouds below. Another Brit, Paul, turned up after us so we had quite a pleasant evening together. 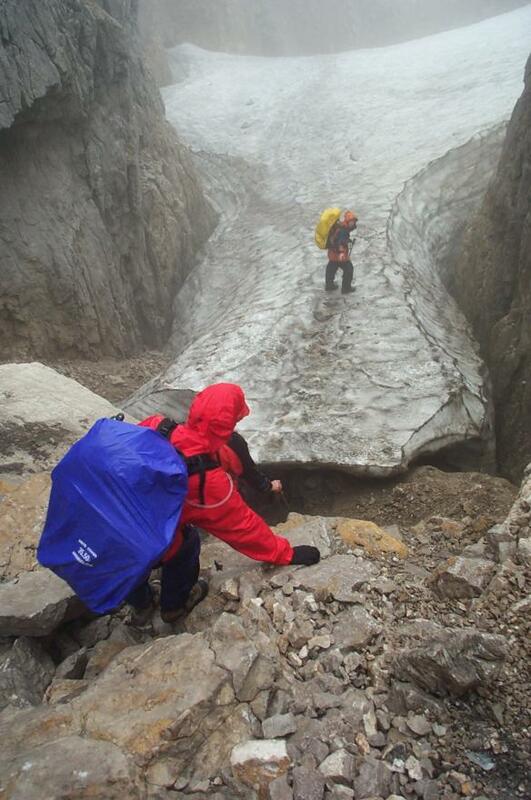 This is the next morning - the weather had turned damp and it wasn't looking promising for more ascent. However, it was good for salamanders! 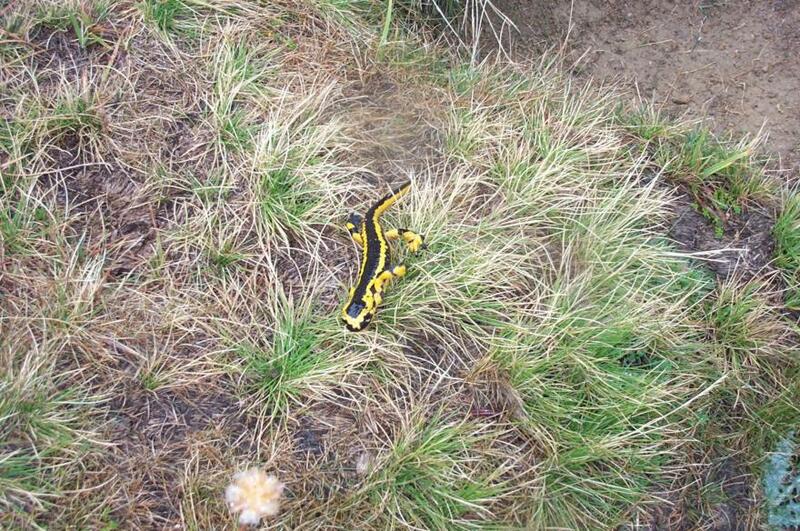 There were two of them - one yellow and black and one black and yellow. I've never seen one before and they're cute, slowly clambering over all the (for them) tall grass. The path quickly disappeared and we were back to trying to follow the yellow flashes through the rocks. The col, where we camped, is in the background. 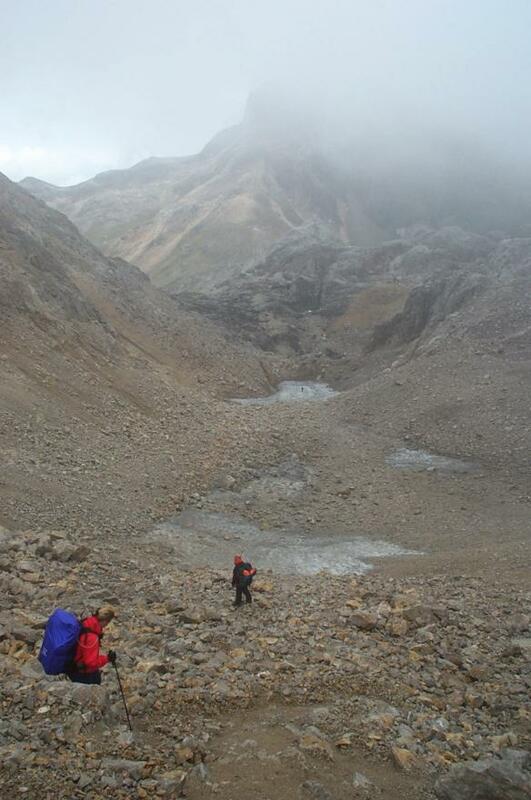 The cloud had been hovering but as we clambered up the scree towards La Forcadona pass it got very thick. By this time we'd virtually given up using the map and were relying on the book. Unfortunately, the description is not much use if you can't see anything. Anyway, eventually we found the flashes that marked the way over. 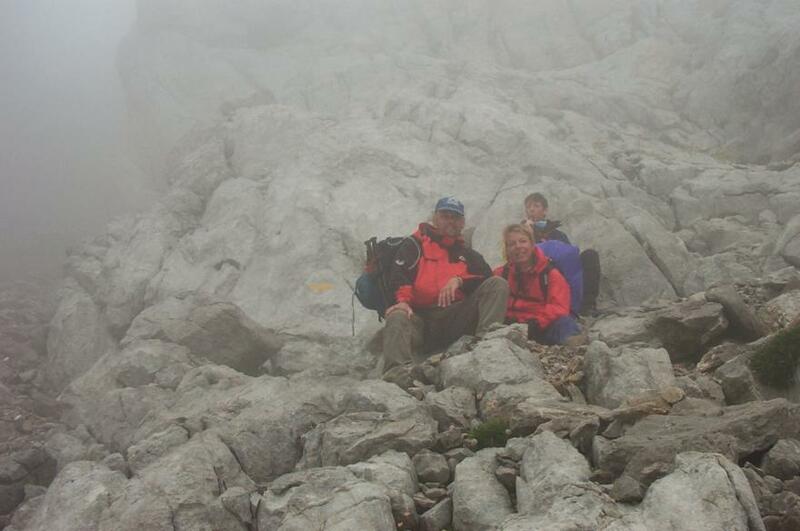 Here we are waiting for Paul, whom we could hear somewhere on the scree below us. The route out is up to the left. 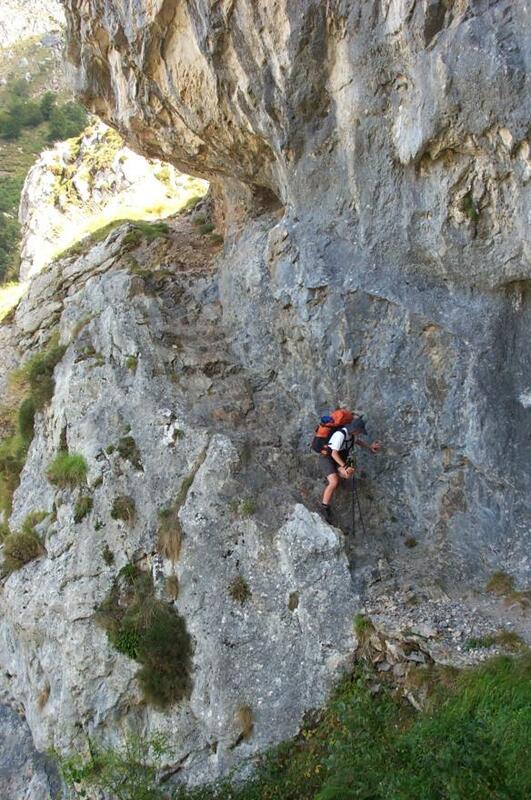 The last bit up to the pass (2302m) is, I reckon, a full-blown Grade 1 scramble which Sian took in her stride. From the pass there is a path to the right which climbs another 300m to the summit of Torre Santa de Castilla, the highest point of the Western Massif - but not today. Instead we drop down onto the El Neveron ice field. The descent is over very loose ground so I rig up a belay and use the rope that I had been carrying for just such an occasion. The step onto the ice field was very dangerous - one slip and we'd have been jammed under the ice. It had started raining so the ice was very slippy and most of the ground moved as soon as you put any weight on it. Luckily, we all made it across safely. Further on we dropped out of the cloud. And then it cleared all together. The ground got firmer but still quite dangerous. There were plenty on leg, and even man-sized holes in the limestone. 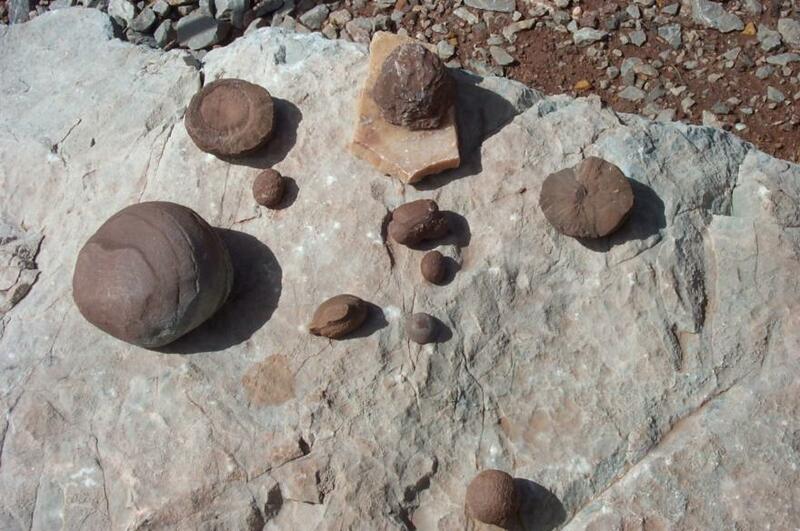 We came across an area that was obviously good for fossils. There was plenty of evidence of camping and rummaging around in the rocks. Someone had even laid out a selection for us to look at. 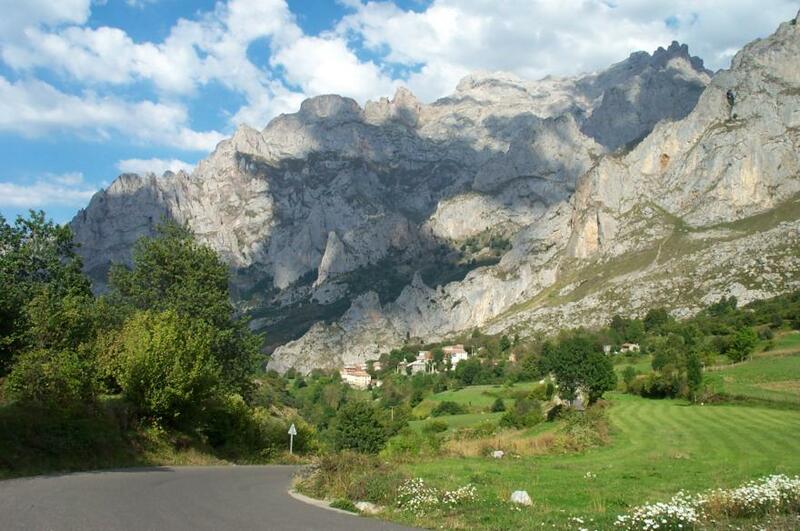 This is the Colado del Jou Santu and offers a good limestone panorama. 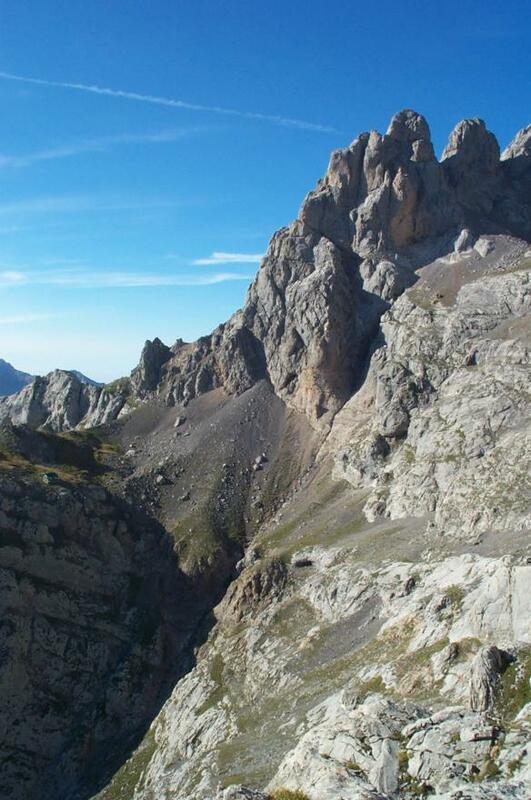 In the distance, through the col, is the Central Massif and another route to Cain. 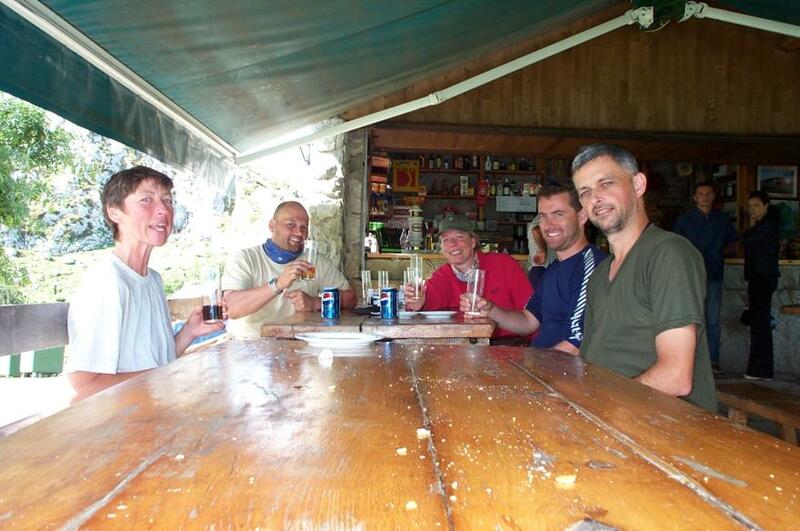 We were all tired when we reached the Refugio de Vegarredonda after another long day. 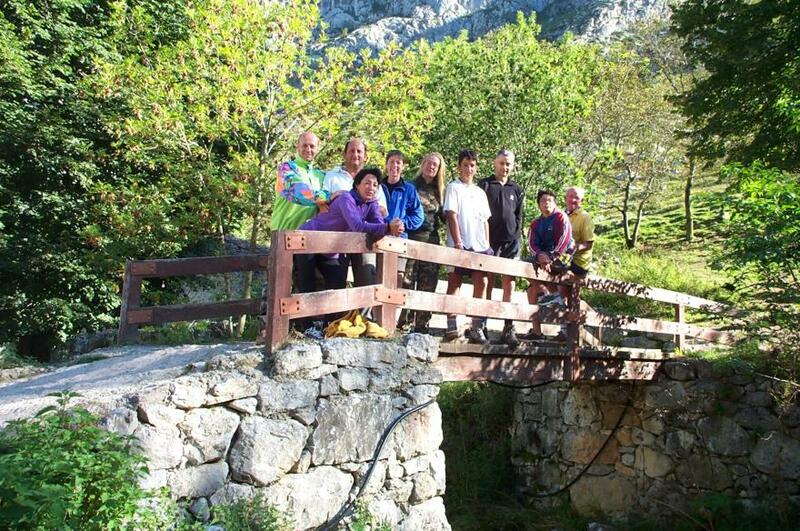 We soon perked up when we found the Moffats yet again together with an organised group (more Brits) many of them on their first night in a refugio - mmmm... This is the next morning when we made an excursion out to the Mirador de Ordiales. It was very windy so we didn't venture too close to the edge. On the other side it drops almost vertically to the valley below. 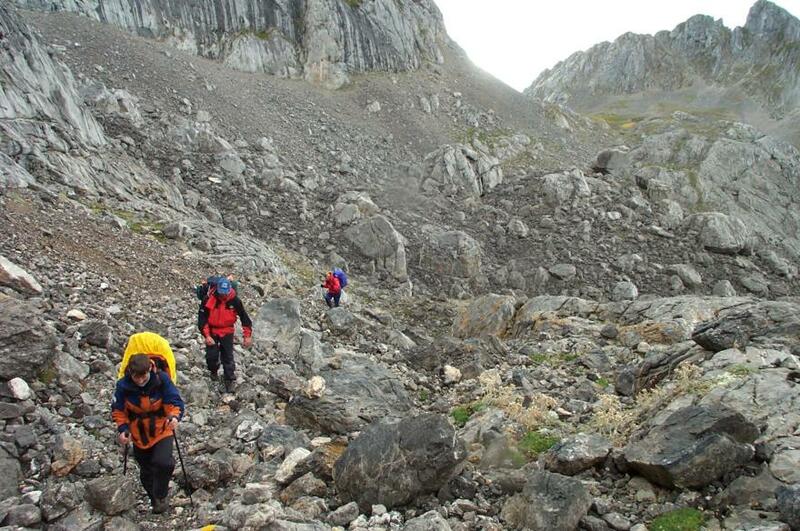 Then back to the refugio to pick up our sacks. It's a nice place, plenty of room for everyone and the guardian and staff are very friendly. They even have a bar that sells wine in boxes - easier to carry out than bottles. Feeling rather sad now as we dropped down into the pasture land. Looking back we could see that, up top, the weather wasn't so good. 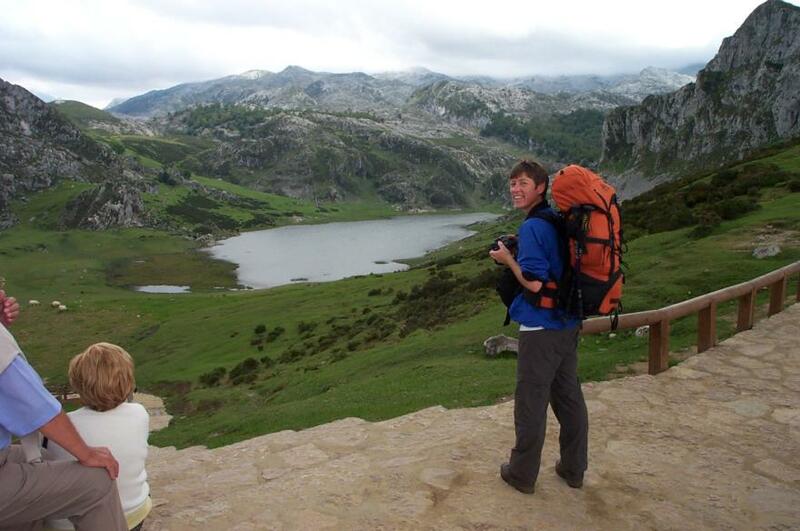 Nearly back - this is Lago de Enol, the other lake. We made it! A celebration drink in the restaurant by the lake. Later, Paul carried on round while we took Sian and Phil to the Parador in Cangas de Onis. Then Anne and Jim carried on the coast and bummed around on the beach in St Vincente for three days before returning to Madrid.